SHANGHAI, Oct. 10, 2018 /PRNewswire/ -- Today, at HUAWEI CONNECT 2018, Huawei held a summit themed of "Activate Intelligence: The Innovative Path to Intelligent Cloud Data Centers". At the summit, Hou Jinlong, President of Huawei's IT Product Line, delivered a speech "Activate Intelligence: Innovative Path to Huawei Intelligent Full-Stack Cloud". The representatives from finance, healthcare, energy, and Internet companies shared their joint innovation practices in AI, cloud, and HPC fields. Huawei awarded customers with the "Cloud Data Center Super User Award 2018" to commend their consistent support to Huawei. 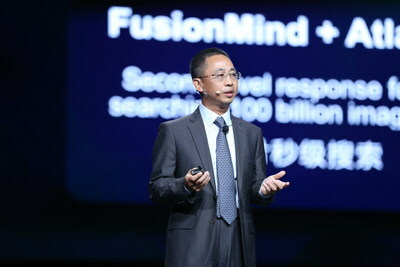 Also, Huawei released the full-stack private cloud solution FusionCloud 6.5 and introduced the new-generation mission-critical cloud storage FusionStorage. These solutions add new capabilities to Huawei's substantial array of cloud and storage support to lay a solid foundation for building an intelligent world. Hou Jinlong said: "Extensive applications of AI technologies drive our society into a more intelligent world. Huawei is committed to integrating AI technologies with IT infrastructure such as cloud data centers, intelligent cloud computing and storage, helping customers create business value in their digital and intelligent transformations by leveraging full-stack cloud solutions with full lifecycle service capabilities and comprehensive ecosystem competitiveness." HUAWEI CONNECT 2018 - "Activate Intelligence" - is held at the Shanghai World Expo Exhibition and Convention Center and Expo Center from October 10 to 12.This year's HUAWEI CONNECT conference is designed to help all businesses and organizations step over the threshold and stake their claim in the intelligent world. You will be joined by the best minds in the industry - including global ICT leaders, industry experts, and ecosystem partners - to chart the way forward and explore new opportunities.